"Only pure focus keeps you going in the darkness." There is a legend, denied by the authorities, that sometimes ships will disappear later to reemerge, changed. The Lost Ships. Following one such rumour, Opal steals an experimental vessel making alterations to the onboard AI, and heads out into far space search of what might be there and finds what appears to be the luxury passenger liner, The Solace, lost 14 years before, hanging seemingly read and lifeless, already caught on the edge of the gravitational pull of a neutron star. Something about it, however, is odd as Opal prepares to try to gain access to explore. This thrilling and claustrophobic novel is unusual in that, essentially, there are only two characters, Opal herself and the modified AI of her stolen ship, who she has named Clarissa. Any other appearances a very few and brief. The story is told through the conversations between these two main protagonists, their evolving relationship and the battles to survive. Marisha Tapera narrates, her lovely voice building tensions and excitement as well as character building as she very closely follows the nuances of the text in pacing, intonation and tonal variation. A superb performance. One oddity noted is the numbering of the chapters which work not from one to twenty eight but in reverse from twenty eight to one, completely committing chapter number eighteen. Whether this is a simple mistake, although I doubt this, or there is a significance I failed to unravel, it added a tiny frisson to the strangeness of the book. This is the first novel from author, Karl Drinkwater, that I have read and it certainly wi!l not be the last. I am truly grateful to the rights holder of Lost Solace who at my request, freely gifted me with a complimentary copy, via Audiobook Boom. It is one of those very occasional books to which I wish I could award an additional star of excellence beyond the normal five star rating. The story was intense and involving, a perfect melding of book and narrator, and though complete in itself, left me wanting more. Excellent, and recommended to anyone with a S.F. leaning. 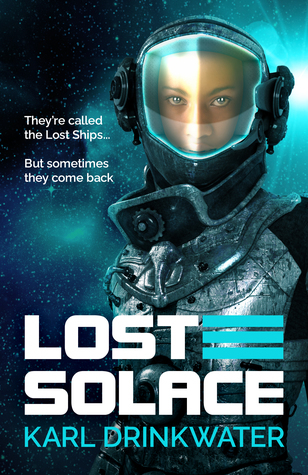 Sign into Goodreads to see if any of your friends have read Lost Solace. Hi Norma, many thanks for this lovely review! I like to mess around with structure in that way, making it reflect elements of the story. The sequel has a similar trick with chapter numbers. Another of my books used structure to mess with people's heads even more! It is a bit clearer in the physical book - the audiobook numbering makes things harder to spot, but Audible doesn't let publishers change that. Thanks again! I really appreciate it when people take the time to leave a review.